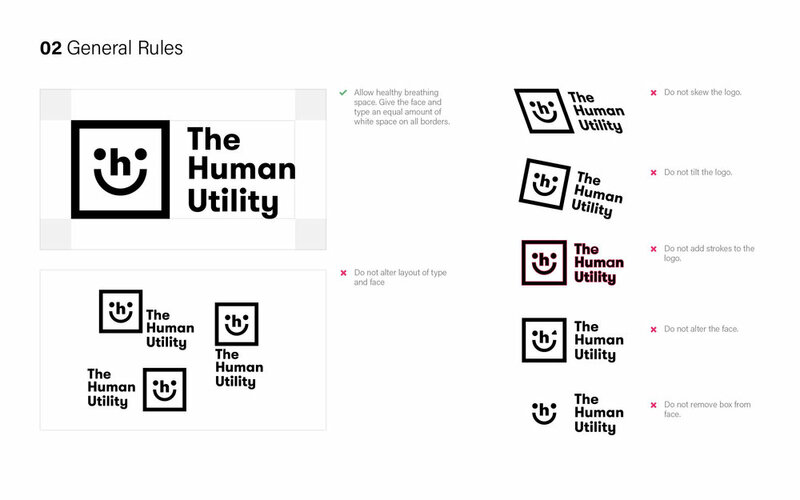 Alongside Ryan Putnam, I worked on the logo and brand guidelines for Human Utility. I worked with the founder of this radical organization, Tiffani Bell, to create a logo that could stand for the work that Human Utility does as well as future projects that may be launched under the HU umbrella. The logo needed to be bold and allude to people-focused work while maintaining a certain neutrality that could stand to represent varied communities and causes. We developed a face logo that made use of a lowercase "hu" within the structure of the mark. This marks works well because the colors can be edited to communicate different moods and projects while the plain black logo stands for the org overall. The boldness of the mark lends itself to a variety of physical merchandise. After we had landed on a logomark, we put together a brief guide that showcased some brand rules regarding usage and stylistic direction/ideas.